Following a week of big Last Jedi reveals, we have some more cool intel for this impending Star Wars sequel. LEGO sets that will be hitting stores this September, as part of the annual Force Friday event, have leaked. 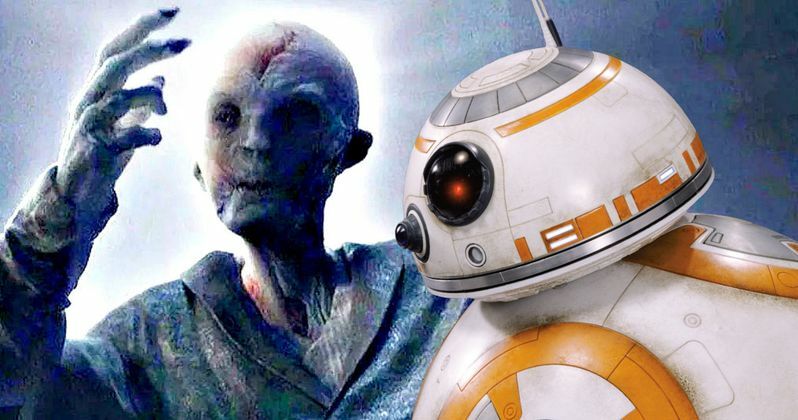 And the two biggest takeaways are a new look for Snoke and Imperial BB-8 doppelgangers going by the name BB-9e. These LEGO sets also confirm the return of the AT-AT Walkers. We'd previously heard that these new machines would be called Gorilla Walkers due to their simian-upgrades, which include a huge flaw fix that no longer allows the Walkers to be taken down by any old Jedi with a really long spool of wire. These new AT-ATs are actually called the 'First Order Heavy Assault Walker', and as you can see in the Tweets below, they come with some cool new Mini-Figs that include Rey in a look we've already seen, a Resistance Trooper that doesn't look much different than the last time we saw them, a very cool new First Order Walker Driver, who arrives with a black stripe down his helmet, and a First Order Stormtrooper. We also get a new take on Poe Dameron, who's figure looks like an unshaven Han Solo. We got to see Oscar Isaac's new Bespin-looking costume in the recent Vanity Fair shoot. In these leaks, it looks like Poe has been promoted to Captain. Also on the LEGO menu today is a look at the new Resistance Bomber. It's a great early look at one of the new ships in Star Wars: The Last Jedi. And we get to see the first-ever toys for Laura Dern's pink haired character Vice Admiral Amilyn Holdo and Resistance Maintenance worker Rose played by Kelly Marie Tran. We also see Rose's sister Paige for the first time, a young fighter pilot training under Poe Dameron. While not much of Paige's plot line has been leaked yet, we do know that Rose and Finn team up for a secret mission that takes them to the Casino City of Canto Bight, where they must break a slicer out of space jail. The coolest reveal here, though, comes with the appearance of the First Order Star Destroyer. We get to see the first-ever toy for Snoke. He's seen in his new golden robes. And surprisingly, he isn't towering over the other mini-figs. Rumors have claimed that he is actually 8 feet tall when seen in real time, and that he towers over everyone. We've also heard that Snoke is a practically puppet this time out, aided by the voice of Andy Serkis, as opposed to Serkis playing the character via motion capture. Also included in this set is BB-8's own Evil Cooper Doppelganger, called a BB-9e Unit. Take that, Dougie! Many rumors leaked by Making Star Wars in the lead up to The Last Jedi this December are confirmed by these toys. It's not rare nowadays for some big secrets to be revealed by early toy leaks. And no matter how hard Disney and Lucasfilm try to keep this stuff under wraps, it still gets out. Case in point, these beautiful new toys you see before you.